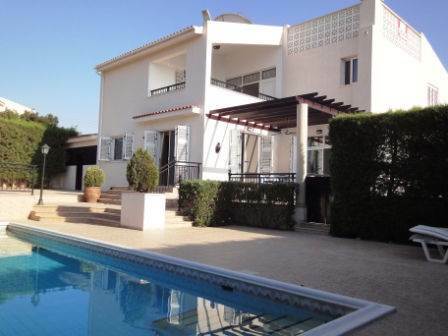 Cyprus Property Blog by Cleo : Fantastic Villa in Paphos (Konia) - Price Just Reduced! (Title Deeds too) NOW SOLD! • 290 sq. m., 3 bath, 4 bdrm 2 story split "Luxury Villa" - €575,000 EUR - Title Deeds - NOW SOLD! Konia, Paphos, Cyprus - This luxury 4 bedroom detached Cyprus villa is located in the sought after village of Konia in a quiet residential cul-de-sac. Paphos is a few minutes drive away. The property has been cleverly designed by the current owners to suit their individual requirements, and yet with options to easily add additional rooms if required. It has been built to a high quality specification with every comfort in mind. The first thing that hits you when you walk into this property is the impressive marble staircase winding up to a central gallery. The downstairs rooms are all accessed from the wide spacious hallway, which also has a practical study area. A large separate lounge and formal dining room with patio doors leads to a large veranda overlooking the pool area, which can also be accessed via the family kitchen. This stunning room is one of the largest in the house with solid oak cupboards, granite worktops, built-in double oven and microwave and integrated dishwasher. The fridge/freezer, washing machine and dryer are housed in a separate utility room off the kitchen which leads through to the garage and driveway, off which is a very useful large storage room. One bedroom is downstairs and is currently being used as a second sitting room, and the guest cloakroom with fitted vanity unit can easily be converted into a full bathroom is required. Off the central gallery landing there are 3 double bedrooms all with fitted wardrobes and en-suite facilities. In addition the master suite has it’s own walk-in closet. A large covered balcony with stunning sea views has provision for central heating and can easily be converted into an additional room if required. Outside there is plenty of space to relax and for outdoor dining, with a large patio area overlooking the pool and a further area at the side of the property. Mature hedges provide excellent privacy. This is truly a wonderful family home.